The Exiled is the second novel in the War of the Roses series featuring Edward IV and Anne de Bohun. In the first novel of the series, The Innocent , Anne worked her way up into the king's court as a servant and all-knowing medicine-woman attending the queen. Anne's gentle ways, intelligence and beauty caught the eye of King Edward IV, and the pair worked carefully to keep their love for each other a secret. In The Exiled , Anne de Bohun, now having full knowledge of her true identity and royal bloodline, has escaped to Brugge, where she has established herself as a successful merchant and businesswoman. Much to Anne's dismay, she finds herself still in danger as several assassination attempts are made on her life, with Queen Elizabeth Grey as the prime culprit behind the attacks. Therefore Anne must be more cautious than ever, relying on her intelligence, wit, insight, and strategic abilities in order to survive; all while her love for King Edward IV burns as strongly as ever. Posie Graeme-Evans once again creates an elegant, page-turning tale featuring a highly likable and admirable heroine. Anne de Bohun's character in The Exiled is much stronger, confident and has more panache; while hating Queen Elizabeth Grey is inevitable because of our loyalty to Anne. 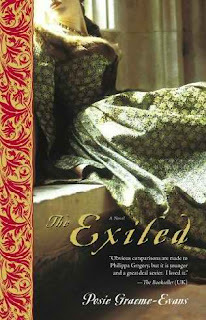 It never fails to amaze me how historical fiction authors can influence you to take certain sides of characters in specific novels; for example, it's amusing to read Philippa Gregory's The White Queen told from Elizabeth Grey's point of view as "the victim" and then reading The Exiled in which we passionately hate her. For it's setting in time and place, The Exiled causes Anne to stand out more than ever as one of the most memorable heroines in the historical fiction sub-genre. As for Posie Graeme-Evans' writing style, her stories are so richly and intricately composed that you can vividly picture and imagine the setting perfectly. Whereas some historical fiction novels give you a detached glimpse into the lives of the figures in question, Graeme-Evans places you right there with them, making for an addicting and involved experience. The outside world will truly fall away when you read this series! I HIGHLY recommend all three novels. The final book in the War of the Roses trilogy is called The Beloved (2006), with the alternate title being The Uncrowned Queen in the United States. Graeme-Evans has also written a stand-alone novel titled The Dressmaker (2010).